Day Sign Company, nestled on a quiet side street in the small town of St. Albans, West Virginia, seems a far cry from all of that. James L. Day has been making neon signs by hand for five decades, providing custom offerings to businesses across the greater Kanawha Valley. 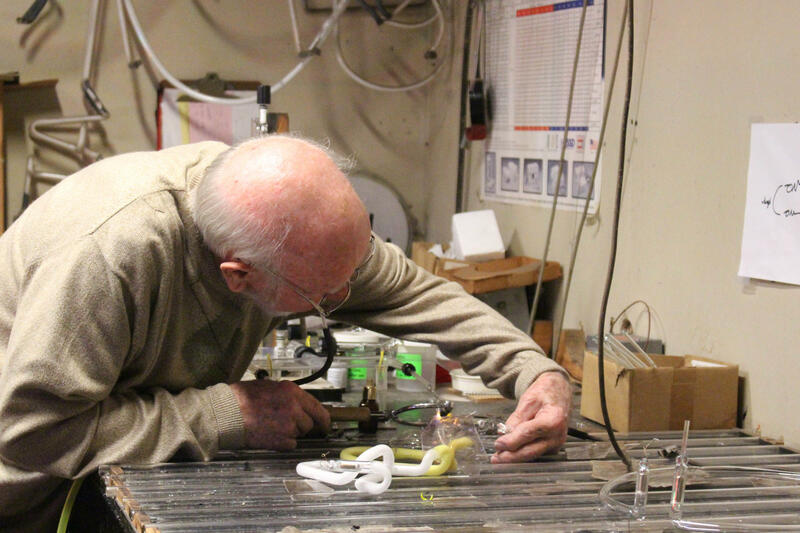 85-year-old Day started this workshop in 1964 when he and his wife, a St. Albans native, moved from Cincinnati, Ohio. Having always been artistically inclined, Day started out as a hand sign painter, but switched to neon as demand increased for the style, teaching himself the trade after observing other neon sign makers. While neon signs are ubiquitous, most people don’t really know what a neon sign is actually made of, or that they’re almost all made by hand. "It’s a piece of glass that’s bent the way you want it to bend, and there’s an electrode on each end of it and filled with gas, and when it’s hooked up to a transformer it’ll light up," Day explains. Day’s workshop looks like some mad scientist’s den: three open flame torches burn at about 800 degrees, providing heat for him to bend the glass into shapes and letters. A manifold with valves and gauges sits in the corner — Day uses this to create a vacuum in the glass tubes and pump it with neon or argon gas. Neon burns a bright orange-red, and argon burns blue. An electric transformer, pulsing with voltage, sits next to the manifold, and various lengths of different colored glass tubes hang on the wall and are strewn about workshop tables. Once all the letters are formed, he welds the letters together in the crossfires to connect them into one piece. "Next step, I’d take it over and put it on the manifold, and pump into it with the vacuum," Day says. "When it’s in a vacuum, it should light up, and after it lights up, it’ll burn the impurities out of it. After it cools, that means it’s sterile and it’s ready to gas." After bombarding the unit with gas, he hooks it up to the transformer. If there are any impurities remaining in the unit, it won’t light up. The color of the sign depends on the combination of the gas and the glass. Day makes the whole process look easy. But he’s constantly making micro adjustments, heating the glass just enough so it will bend without breaking, making sure the letters are formed with the exact angles, and being careful not to overfill the unit with gas — all while trying to avoid injuring himself. "I always plan on getting burned or getting cut — usually burning is the worse," he says. Day is one of the few active neon sign makers in the Kanawha Valley. If you have a favorite sign in the area, you can probably bet he’s made it. His work is on display at the Charleston and Huntington airports, the Charleston post office and numerous businesses. Like the old blues trope of the musician who performs in juke joints on Saturday night and church on Sunday morning, Day has made signs for bars and churches alike. After all, neon is that beacon in the dead of night indicating life and spirit — whether liquid or holy. "I’ve done several churches, a lot of them. I have done several strip clubs. I done one we put up at Parkersburg — it had a neon lady on it. And I was gonna paint a picture of a naked lady over here on the church, and my wife said she wanted to pose for me. I said, 'well that’ll be alright,'" he says, laughing. He didn’t end up making a sign of his wife, but he did make one for her, wired into the kitchen lights. The sign reads "Barb's Kitchen" in a bright pink neon, hanging above the kitchen sink. After over 50 years in the industry, Day has noticed changes. Many neon signs are now being replaced with LED and vinyl signs, but he’s hopeful about a neon-revival. "I believe eventually neon will come back," he says. "I think it has in different places. I think they use a lot of it in different parts of the country. Course Vegas is, Las Vegas is big on neon, they always have been." Regardless, he knows his work will live on. If made well, neon signs can last for nearly a hundred years. "I’ve had 'em, brought 'em in here before when they were 75 years old and older than that," he says. "Still burning." Despite the decline in demand, Day is unequivocal about the universal allure of neon — no matter if you’re a churchgoer, a barfly, family, or friend. "Everybody comes in and I say, 'if you don’t like a neon sign, there’s something wrong with ya,' and they’ll say, 'yeah, that’s right!' Everybody likes neon." Emily Hilliard is the state folklorist at the West Virginia Folklife Program, a project of the West Virginia Humanities Council. The project is also supported by the National Endowment for the Arts (NEA) Folk & Traditional Arts Program. This story is part of an episode of Inside Appalachia about people who are working to preserve a part of American culture and traditions. Click here to listen to the full episode.